I was inspired by pop artists such as Ed Sheeran, who in the prior months had used mysterious social media posts to hint at an upcoming album release. 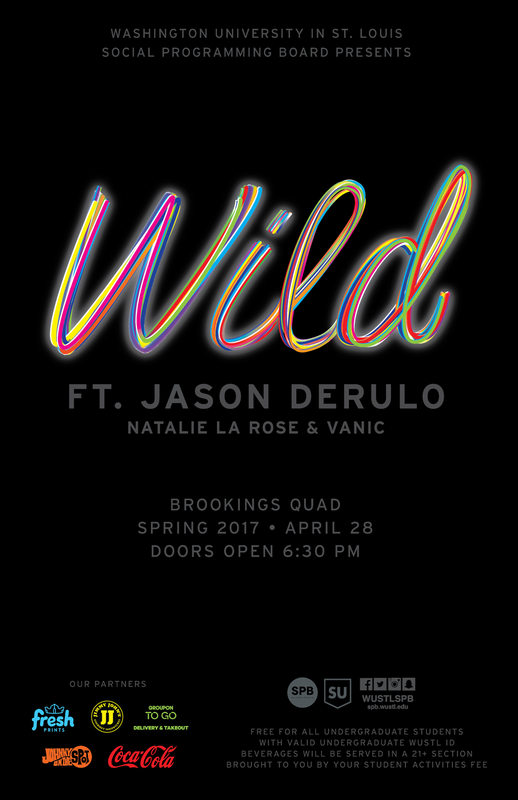 WashU students never know the date at which SPB will announce the upcoming WILD artist. I used grey on black as an antithesis to the upcoming colorful graphics and also to literally "black out" our Facebook profile and Instagram feed. The colorful, but ambiguous gif was released midweek. I designed multiple snapchat geofilters for the events leading up to WILD, such as a happy hour and pre-concert parties. At the concert there two geofilters available for the entire event, and one with that went live right at 9:00 PM when the surprise artist (DJ Vanic) took the stage.